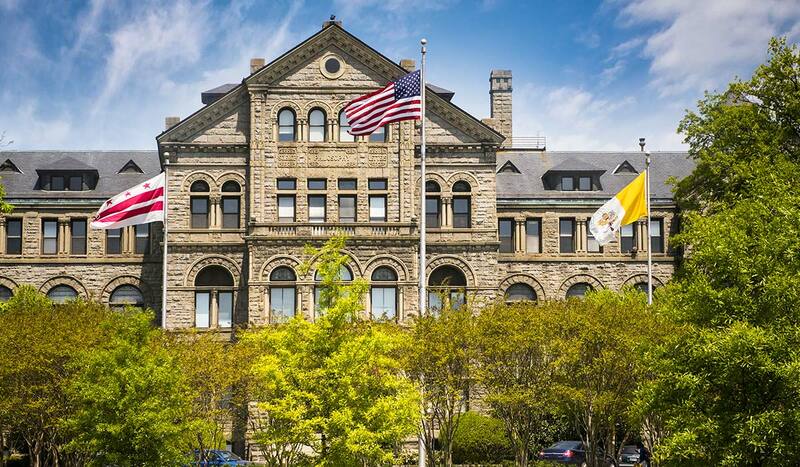 The University is led by President John Garvey, the 15th president of The Catholic University of America. The provost and senior vice president is Andrew Abela, who is the chief academic officer. The University is also governed by the Academic Senate and the Board of Trustees. The 12 schools of the University are led by their respective deans. Theological College, the seminary that is affiliated with Catholic University, is led by its rector. The senior administrators provide important leadership for our administrative departments. The official policies governing the University are posted on the University’s website and are publicly available. President John Garvey invites future students to join the supportive academic and faith-filled community at Catholic University, where they will enjoy all the benefits of our D.C. location, our beautiful and safe residential campus, and an education that will help them aim higher and achieve more. The responsibility for governance and oversight of the operations of the University resides in the University’s Board of Trustees. The 12 schools of the University are led by their respective deans. Theological College, the seminary that is affiliated with Catholic University, is led by its rector. The University’s administrative offices support the University through advancement, student affairs, enrollment management and marketing, finance, general counsel, compliance, public safety, and campus ministry. This body meets regularly during the academic year to discuss the current affairs of the University. It serves the University as a sounding board and as a vehicle for better dissemination of information.